In the primary classes students focus on the basic reading skills of phonemic awareness, phonics, vocabulary, comprehension, and fluency. These skills are essential in developing healthy and successful lifelong reading habits to support writing, learning in the content areas, and personal growth. In writing students will share ideas, knowledge, and opinions in a meaningful way. Cursive handwriting is introduced in the second grade but mastery is not expected until grade 3. Developing mathematical thinkers is the core of the mathematics program as students explore and interact with numeration, computation, data, shapes and patterns, and rudimentary algebraic thinking. The science curriculum is designed to address goals established in the Next Generation Science Standards (NGSS), with special attention to God’s wisdom and power as demonstrated in the predictability, complexity, and wonder of our natural world. 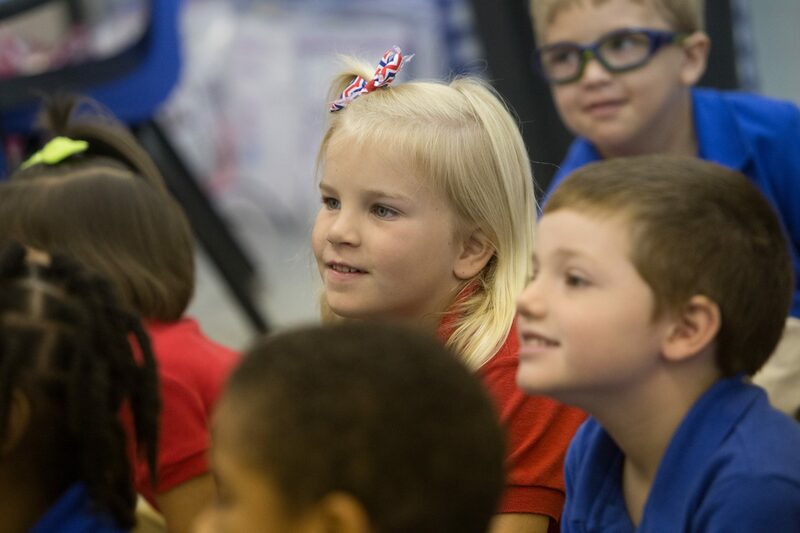 The social studies curriculum includes content aligned with The Next Generation Sunshine State Standards (NGSSS), with instruction in history, geography, economics, communities,) and humanities. Daily Bible classes emphasize God’s great love and promises to His people through popular and easily understood stories of the Old and New Testaments. Children learn of their own opportunities to serve, and responsibilities toward the heavenly Father.